Photographs provided by Virginia Hassenflu. Mrs. Hassenflu hosted the show from 1954 until 1964. She landed the job quickly, as one of only a few candidates who already had TV, classroom and recreation experience. After graduating from college, Mrs. Hassenflu worked briefly as a physical education teacher. 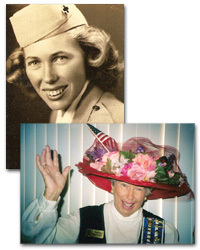 But with World War II raging overseas, she was called to serve her country and joined the American Red Cross. She worked as a recreation worker in the Philippines and Japan, helping entertain and plan activities for soldiers stationed in the Pacific. Mrs. Hassenflu on set in the “Romper Room” classroom. These days, Mrs. Hassenflu is best known for her involvement in the DAR and the community of St. Augustine, Fla., where she has lived since 1988, after relocating there with her late husband, Arthur. With President Truman on the set of "Romper Room." Mrs. Hassenflu’s passion for genealogy and history has been an asset to the Maria Jefferson Chapter, St. Augustine, Fla., which was named for Thomas Jefferson’s great-granddaughter. Involved in the chapter since before she relocated to St. Augustine, Mrs. Hassenflu served as Chapter Regent, Vice Regent and Registrar, and is now Honorary Chapter Regent. When she was Chapter Regent, Mrs. Hassenflu led her chapter to erect a marker in the city’s Plaza de la Constitución to honor the Patriots who were held as prisoners in the area during the Revolutionary War. “Among the prisoners held here were three signers of the Declaration of Independence: Thomas Heyward Jr., Arthur Middleton and Edward Rutledge,” she says. Today, Mrs. Hassenflu is researching a DAR Patriot from St. Augustine and hopes to start planning a marker for him soon. She is also helping the DAR prepare for St. Augustine’s 450th birthday, which will take place in 2015.